1955 Cadillac Rear Bumper ends (sold out) or 1963 Cadillac Front Bumper Ends start at $550 which need repair……. $950 Each for good rust free ends, While Stocks last,,, Classic Cadillac Parts Offers! American Classic Cadillac parts and cars for sale. Please go to Cadillac page for full details on more Cadillacs. This car has had a restoration started. Completely apart, many parts rebuilt/new. Runs, needs restoration, factory air conditioning. Loaded car with tri-power, power windows, power vent, windows, power door locks, radio foot control, power trunk, air conditioning, fog lights, power antenna, power seat, automatic eye, new paint, chrome, leather interior, driver quality interior. Original black car with black and white interior. Nice original car which originally was an Air Force car. Driver in primer. Driver quality interior..
White top with red leather. Good Car. Driver in primer, good car. A 1963 Cadillac and a 1969 Cadillac four door hardtops, these Cadillacs have good clean fenders and doors. 1977 coupe and something different to Cadillacs. We have 1951 and 1952 Buick four door sedan. Please go to our new link on the top menu under 'Classic Part On Offer'. This link will take you to more details on this 1951 1952 Buick; other new arrivals such as the formentioned 1977 coupe. Also to this month new arrivals are a complete 1963 cadillac four door hardtop and complete front "Dagmar's" front bumper ends from cadillac years 1955, 1956; 1957 cadillac's. These front "Dagmar's" front bumper ends are all very clean and sell for $1,300 a set. New arrivals to classics this month is a very clean 1980; 1983; 1977 Cadillac parts cars, all Cadillac have very nice metal, fenders hoods; doors. The insides of these Cadillacs are for the most parts complete. The front bumpers from the Cadillacs are all rust free. Also new to this month are two 1955 Oldsmobiles, the oldsmobile have fantastic front bumpers and grilles, the body work needs some work, but the two door hardtop fenders; door; trunk are in very workable condtion. Please e-mail me for pictures form any of these Cadillacs or Oldsmobile. New arrivals to Classic Cadillac this month are a 1983 Cadillac coupe devile; 1980 Cadiilac sedan deville. Both these Cadillac are rich with rust free panels and fenders, doors; hoods. Please e-mail me for pictures of these classic Cadillac's. 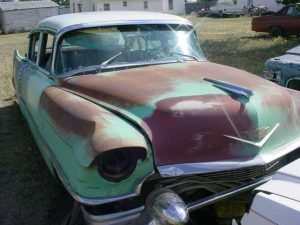 Also to new cadillac parts is a 1955 Cadillac sedan and 1977 Cadillac coupe, again these cars are very much rust free on most of the doors, fenders, hoods and trunks. Thanks for looking at Classic Cadillac's parts. New to This month classic Cadillac parts car is this 1956 Cadillac four door post car.It's front bumper and rear bumper are in very good shape, the front dagmars are rust free, and the rear all important rear bumper ends(Very hard To Find) have complete rust free, and no holes. Much of the glass on this 1956 has been broken, but the insides are still in great shape for it's age, the inside chrome and steel are very much all there, and orignal A/C system is also for most part intact on this 1956 Cadillac. The engine is all there on this classic Cadillac 1956, the hard to find (Batwing cleaner) is in very clean condtion, and most of the A/C parts are intact. The hood and fenders; Doors; a trunk are in fair shape and apear to have no rust. Please feel free to e-mail or call for more pictures to the parts you may need from this classic Cadillac 1956 four door hardtop. New to our parts car are these four door hardtop 1963 Cadillac and 1976 Cadillac sedan devilles, the 1963 cadillac is complete, however you see the all important front bumper assemblies and hard to find front bumper ends are missing in the pictures, these are stored safe, please contact us for more information and pictures, the 1963 Cadillac sedan has good rust free parts, doors,hood, trunk, and clean glass, the 1963 cadillac has most of the original engine, but the transmission has been sold, most of the trim is here on the outside, but has many dings and is not our best 1963 cadillac parts car, however, all the trim on the insides are clean and good road users condtion.......The 1976 Cadillac sedan deville is another complete Cadillac, it has a complete 500 engine and transmission, all the trim on the outside is in fair condtion, the 1976 cadillac has also good clean doors,hood,fenders,and trunk, most of the insides are there, and again in fair condtion, the 1976 cadillac does have good clean fender, again if you would like any more information please call or e-mail me regarding these two new parts Cadillacs 1963 cadillac and 1976 Cadillac. New Arrivals to classic Cadillac New arrivals this month are two 1961 Cadillac four door hardtop, and one 1962 Cadillac four door hardtop, these three Cadillacs have very clean rust free parts cars only, front and rear bumpers are all clean of hard rust, the 1962 Cadillac four door has very solid front lower bumper ends, these are always nearly impossble to find this way, the front bumper is sold as one complete item only, as with the 1962 Cadillac rear bumper, its in fair condtion, some dull chrome, but very rust free. the 1962 Cadillac has full glass on offer, and also hood and trunk trim in clean condtion, please e-mail regarding part for this 1962 Cadillac....... the 1961 Cadillac four door hardtop has very clean and solid front lower bumper ends, the rear bumper on the 1961 has also very bright chrome, but does have some small dings to the centre of the bumper, the 1961 Cadillac has very clean metal,hood,trunk,and doors are all rust free, the all important front fenders from the 1961 Cadillac are here and are some what rust free condition, the fenders are very, very hard to find in any condition these days, please call for pricing! New to this month are 1977 Cadillac D Elegance two door coupe, this coupe 1977 is slightly different to the coupe deville, most of the inside bairs the differance the 1977 Cadillac D Elegance 1977 has very clean outside steel, fenders, doors, and front and rear bumper are all clean, all the glass on this 1977 Cadillac are in great shape, please e-mail or call on this 1977 Cadillac.....e-mail colintexas@hotmail.com or call colorado 719 529 9624 overseas interests, please call 719 523 4462. Classic Cadillacs years also New to Parting Out are! Cadillac 1989, a nice 1990 Cadillac, we also have three clean 1977 Cadillac, just also arrived is a very clean 1965/1966 Cadillac sedan deville, this 1965/1966 Cadillac has very clean panels, fender, doors,,,, these can be seen on... Parts Cars , all parts cars with little to no rust, please e-mail us today! !